Please note: This seat is custom-made and non-returnable. All fabric colors shown on your computer screen are approximate, based on the resolution of your monitor and subject to variation from the actual color on physical chairs. For more accurate ideas of color tones, etc. please contact customerservice@ergodirect.com or call 888-456-ERGO to obtain a sample or fabric swatch. Option of 2 cylinders, 2 footrings provides height range from 17.5" - 33"
1 - Seat Style Click to select (required) Standard Saddle Seat with 22" $20.00 Pony Saddle Seat with 16"
The Saddle seat, part of Humanscale’s award-winning Freedom seating line, is the most comfortable and versatile stool ever made. Its unique, triangular cushion encourages users to sit in a "saddle" posture, which lowers the thighs, opens up the hips and puts the spine into a healthy lordotic curve. 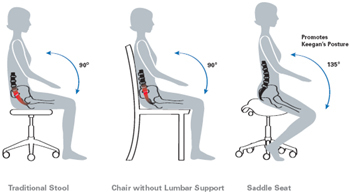 The "saddle" posture also reduces pressure points for long-term comfort and allows users to get closer to their work. It’s simply one of the most comfortable and healthy ways to sit. The Freedom Saddle is equally at home in an office, lab or industrial setting, and its multi-use cushion can accommodate the many sitting positions required for countless applications. Whether it’s used all day long or tucked under a desk for impromptu meetings, the Saddle offers a unique and comfortable seating solution unmatched by any other stool. Optional foot ring and high cylinders for specific applications. Available in a wide variety of textiles, including wipeable vinyls for lab, cleanroom and healthcare use. Kyphosis - Increased Disc Pressure - When we sit in a 90 degree posture without lumbar support, the pelvis rotates backwards and the lumbar curve flattens. Lordosis - Decreased Disc Pressure - Increasing the angle between the thigh and torso allows the pelvis to rotate forward, which helps maintain the natural curvature of the lower back. Foot Ring Diameter 18" or 21"
Foot Ring Height Adjustment (from Floor) 6" - 11"
Standard Saddle Seat with 22"
Pony Saddle Seat with 16"
The cushions on all Humanscale chairs utilize advanced technology developed primarily for the sportswear and sporting goods industries. In a single step, a high-tech molding process combines the textile, foam or Techno gel and plastic support shell into a single, modular unit which can be attached to our seating with four screws. Because of this advanced process, the textiles used on the cushions are as unique as the rest of the chair, and satisfy requirements more demanding than typical upholstery textiles. Created by Elizabeth Whelan Design, Ginkgo reflects the delicate parallel veins of the Ginkgo biloba tree leaves. It is composed of 90% wool, a renewable fiber that offers durability, elegance and flexibility. Available in a variety of vibrant and saturated colors, Ginkgo extends the breadth of Humanscale`s seating color line. Ginkgo`s exceptional performance on contract textile tests and subtle sophistication will satisfy any task seating application. For liquid-based stains that penetrate the textile, blot to remove excess liquid and remove the stain with a cloth soaked in warm, sudsy water. Use a dry cloth to absorb excess water. For more substance-based stains that sit on top of the fabric, scrape off the excess substance with a knife or coin immediately and remove with damp cloth.To restore Sensuede`s natural sheen and luster, brush the fabric when dry with a suede brush. Standard Cylinder - Provides seat height range (17.5"- 23") that accommodates 90% of the population. High 8" Cylinder - Provides seat height range from 20.25 to 28.25". High with 18"/21" FootRing Cylinder - Provides seat height range from 20.25"to 28.25" along with height adjustable 18" or 21" diameter chrome-plated foot ring. Extra High with 18"/21" FootRing - Provides seat height range from 23" to 33" along with height adjustable 18" or 21" diameter chrome-plated foot ring. Question: Does the saddle seat tilt? 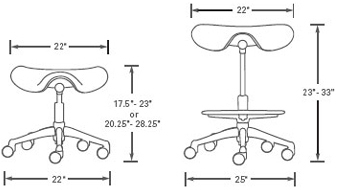 Answer: The Humanscale Freedom Saddle Seat does not tilt. 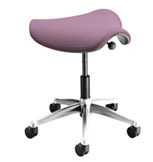 But the Jobri F1465/BK is a saddle seat that has tilting feature. Question: Why you would choose Saddle over Pony seat? Answer: It is totally a matter of preference. The Pony style came out because people felt the saddle did not fit into areas where they needed a smaller seat or some people felt the saddle was a little too big. The main point is to choose the right seat height and select the right cylinder and footring to get you the desired seat height. Question: How can I tell which seat (freedom or pony saddle) is best for me? I am a medium frame, 5'4", 160lbs and want to use this stool for extended work, leaning over work table doing crafts, writing. Also frequent moving around to access crafting tools and supplies. I have lower back pain and some knee issues, so looking for adjustable height to get me above the work so I don't have to stand to look down at what I'm doing. I also work at two table heights, normal, and higher height table for cutting fabric. Answer: The decision for the Saddle vs the Pony seat is one of a personal preference. It doesn’t really have anything to do with the size of the person, but the comfort of the person. Having said that, however, we think you would need a high cylinder with an 18” footring if you choose the pony and a 21” footring for the saddle. This will have the seat height range of 19.9”- 27.5”. This we feel would be best to go to the two height ranges you are looking for (assuming your table heights are no higher than 40”). Please note that neither will help with your back pain as they offer no back support. Question: I will be using this stool on carpet. Which casters should I get? 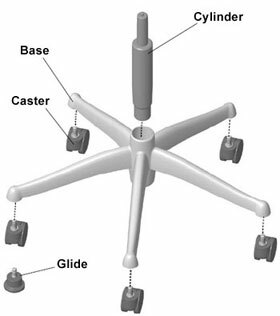 Answer: You can select "Standard Casters," which are included in the Freedom Saddle Seat price. I love my chair which is really more like a stool. It is great for the posture, core and hips. It takes a little bit to get used to, but is well worth it as I feel stronger and stronger. Because it is not cushy, I also believe one gets up and moves around more. I also love that I could pick my fabric and the color. Great product.